In the last ten years, Boston Educational Development Fund has secured and managed more than $108 million in funds, through its deep and proven experience in cultivating and stewarding a vibrant network of private individuals, foundations, and corporations. This philanthropic support and engagement is pivotal to sustaining educational enrichment opportunities and increasing their long-term impact. 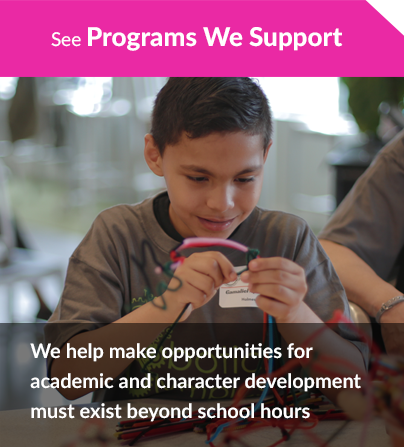 In-school programs that serve as coordinated support structures allowing students to achieve academic and social success in their schools and their communities. Out-of-school programs that provide students with a work-conducive environment to complete their homework, socialize and collaborate with their peers, and participate in enriching extracurricular activities within the school environment. Career readiness programs designed to help students excel in college and successfully integrate into the workforce. The Human Capital Initiative, which has enabled schools to increase their rate of early hiring each year and has allowed them to better compete for the most talented and diverse teachers early in the season. In addition to managing funds to support critical programs and paving the way for educational and vocational opportunities, BEDF also provides Fiscal Sponsorship services including general management, financial, administrative, staffing and fundraising services to privately funded programs in order to maximize their operating capacity, facilitate their timely implementation and ensure proper compliance and reporting to funders. BEDF further increases its value to public schools by providing fundraising support through the aggregation and evaluation of funding opportunities. BEDF assists in the grant writing process through training in refining narratives, creating budget templates, and identifying and sourcing experienced grant writers. BEDF also provides an online platform that allows schools to host fundraising campaigns and collect donations.